What is myostatin and why do bodybuilders want to stop it? Myostatin is a hormone in our bodies that signals muscles to stop growing and replicating. Therefore, when you inhibit, or block myostatin, muscles will be able to grow bigger and you will become stronger. Imagine being able to block myostatin and continue to grow muscle indefinitely – you would be able to become like a super hero. Even a slight decrease in myostatin would result in a dramatic increase in muscle mass, but it would also mean you would need more food to feed those muscles as well. Another problem is that our heart would continue growing, since it is a muscle, and over time this could lead to heart failure due to having this organ work too hard. Besides, in the long run, an unhealthy heart will definitely hurt your gains. Furthermore, you could also argue that your stomach would grow as well because you can’t control what muscles get affected or not. For instance, certain muscles might grow bigger than others. For example, you can have a 50% increase in your glutes and only 20% in your delts. In one human study, overweight females were given a one time dose of 250 milligrams (mg) of Ace 031. As a result, after a month their muscles in the thighs grew over a pound. What’s more, their lean body mass increased 3%, which is quite a result. However, in another study done on young boys with muscle dystrophy, the test subjects ended up having gum and nose bleeding. Unfortunately, both Shire and Acceleron eventually abandoned their partnership, and since 2013 no further development has been conducted. Since then, you can find Ace-031 being sold as research chemicals on various websites, but no trusted brand has come out selling it yet. MYO-029 was intended to be another myostatin blocker by Wyeth, but the results in their trial failed miserably, where subjects had zero strength gains. Fat loss and bone health? In the different studies that were conducted, subjects experienced a reduction in leptin concentration and boosted adiponectin, which is a ‘good fat’ hormone. Hence, perhaps Ace-031 does really contribute to fat loss. Another study showed an increase in alkaline phosphatase in the blood and reduced collagen telopeptide; this may mean it also helps strengthening the bones. In a study with females, the concentration of FSH (follicle-stimulating hormone) dropped significantly, and there is no explanation as to why. Thus, it appears that there are some side effects, and we do not know if the same would occur in men. However, we know that in cattle, farmers refuse to use Ace-031 to ‘beef up’ their stock because of infertility concerns. Therefore, perhaps that connection has to do with mother nature not allowing an ultra muscular being to reproduce? 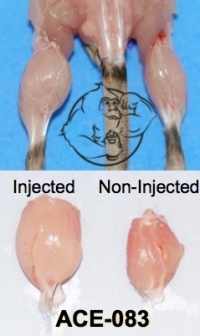 During the studies done on Ace-031, where rats were injected, they were given 10mg/kg. Hence, to match those types of figures, a normal sized adult bodybuilder would have to use about 1 gram a month, all things being equal. This means that if you were to use a gram it would cost you tens of thousands of dollars to get in that amount each month. According to bodybuilders who have been able to get Ace-031, dosages seem to range from 1-3mg per kg of body weight every 1-2 weeks. At $50 per mg, this would cost a 200 pound user around $10,000. Besides, considering the sketchy world of peptide companies, if you were to spend that kind of money, you better make sure it is a legitimate product you were purchasing. The half life of Ace-031 is 10-15 days. Tags: Ace-031 for myostatin is it safe?